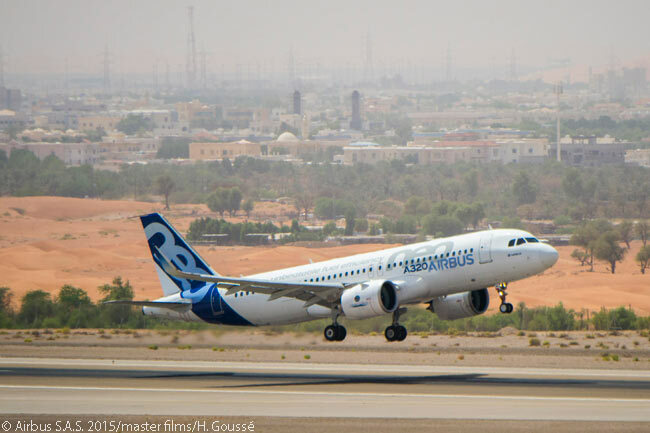 Airbus has received joint type certification from the European Aviation Safety Agency (EASA) and the Federal Aviation Administration (FAA) for the version of the A320neo single-aisle jet powered by Pratt & Whitney PW1100G-JM geared-turbofan engines. The EASA A320neo type certificate was signed by Trevor Woods, EASA’s certification director; and the FAA A320neo type certificate by Jeffrey Duven, the FAA’s manager of transport airplane directorate – aircraft certification service. Airbus’ Executive Vice President Engineering, Charles Champion and Airbus’ A320neo Chief Engineer Pierre-Henri Brousse took delivery of the type certificates on November 24. 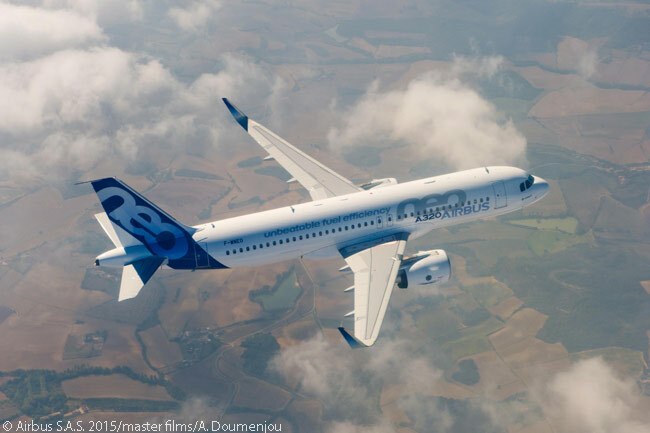 The A320neo successfully completed a rigorous certification program which tested its airframe and systems well beyond their design limits to ensure the aircraft met all airworthiness criteria. Three flight-test A320neos powered by PW1100G-JMs accumulated over 1,070 flight hours in some 350 flights. Of these 1,070 flight test hours, 300 were accounted for by one aircraft operating an intensive airline-like operating regime to ensure the type is fully mature for commercial operations at entry into service. 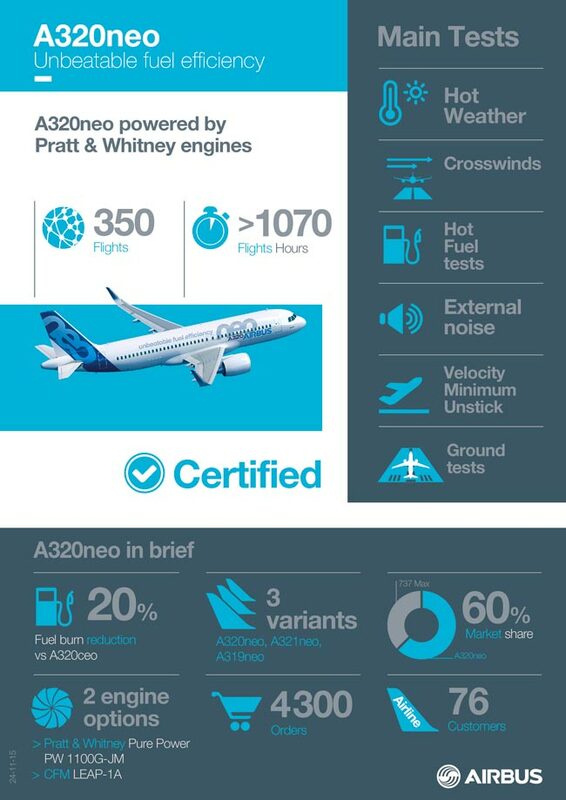 The A320neo with Pratt & Whitney engines is the first variant in the A320neo family to receive type certification. The A320neo with CFM LEAP-1A engines will be certified in the coming months, CFM having already achieved type certification for the LEAP-1A in its own right. Certification of the A321neo and A319neo, in both engine variants, will follow, according to Airbus. The A320neo family incorporates new-generation engines and Sharklet wing tip devices, which together deliver more than 15 per cent in fuel savings compared with current-generation A320s. According to Airbus, the A320neo will offer 20 per cent fuel savings over today’s A320s by 2020, with the addition of further cabin innovations. Launched on December 1, 2010, the A320neo-family program offers airlines an engine choice between the Pratt & Whitney Pure Power PW1100G-JM and the CFM International LEAP-1A engines. 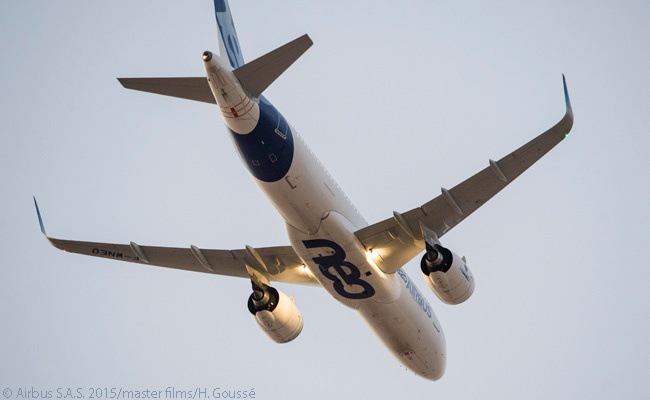 To date, Airbus has won firm orders for more than 4,300 A320neo-family jets, from 76 customers.